These days, one of the most popular entertainment franchises is the Marvel Universe, and with an increasingly dense amount of movies and shows airing, it’s a good time to be a fan. Outside of the movies and comics, there is a world of Marvel to explore that’s created by Lego. 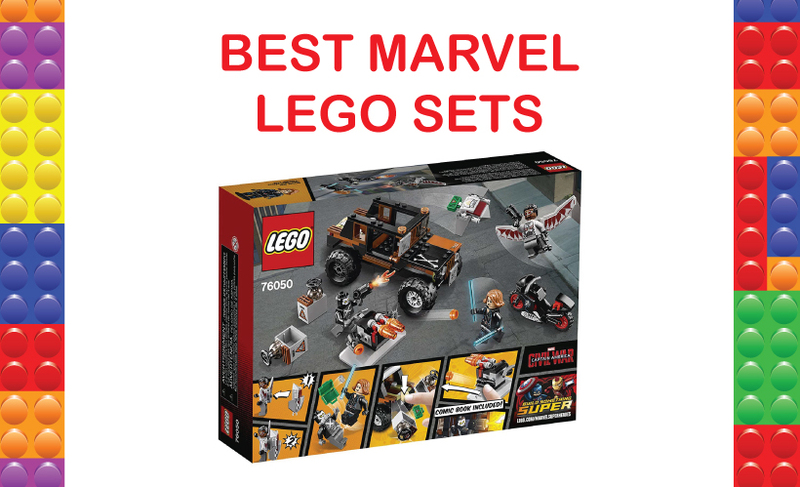 Lego Marvel superhero sets are amazing and feature some of your favorite super-powered protagonists like Iron Man, Captain America, Thor, and Spider-Man. Usually, each has a whole adventure to enjoy with another iconic character or two, so there’s lots of fun to be had. Each is designed to be immersive and fun for people of all ages, so take a look at the products we’ve featured here so that you can know which sets will feature your adventures. The first set in our guide features an iconic scene from Avengers: Infinity War. Featured in the set are a Hulkbuster armor-wearing Bruce Banner, Proxima Midnight, Falcon, and one of Thanos’s Outriders. 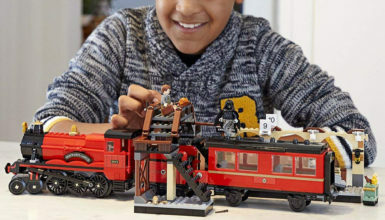 This is a 375-piece set, so it’s not very hard to put the whole thing together, and the total playset is perfect for individuals over seven years of age. The central piece of this set is definitely the Hulkbuster Armor. It has several points of articulation, and the cockpit opens up completely to accommodate the Bruce Banner minifigure. The entirety of the armor is massive; in totality, this Lego full-sized figure is about five inches high, four inches wide, and about an inch deep. In addition to the “Hulking” figure, there’s also an Outrider cannon that fires small balls so that you can have some truly harrowing action pieces. Also, nestled away in the base of this turret is the soul Infinity Stone, which is part of six that you can collect and form your own Infinity Gauntlet. 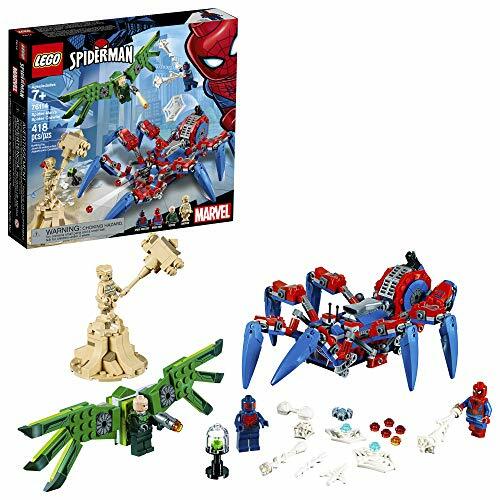 With this Lego set, you can do whatever a spider can, and in this case, this includes battling against the villainous vulture in an eight-legged Spider Crawler. This playset is very entertaining, and it even includes the Vulture, Sandman, Spider-Man, and Spider-Man 2099. As a result, there are nearly infinite possibilities when you’re looking to get into an adventure with the four figures. The Vulture’s wings are entirely comprised of Lego bricks and pieces so that you can articulate them and reuse them in other configurations. The Spider Crawler is similar, and its unique components can definitely provide for some funky and new configurations. Sandman, on the other hand, has his own set of sand-colored bricks, which means that you can build him up as you please, which will highlight his sand-themed shape-changing abilities. The entire set is comprised of 418 pieces, and it’s made for kids over the age of seven. The only drawback for some of the parts is that they are a bit too specialized, so you may have issues incorporating their uniqueness into other creations. This is another set that features Falcon, and this time, he and Black Widow are facing off against the villainous Crossbones. 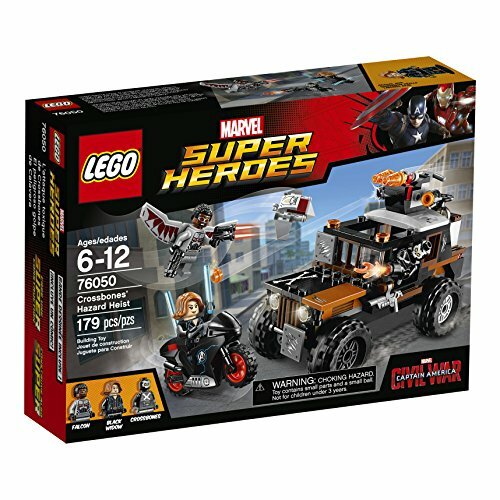 Crossbones is situated in a jeep, and the theme of the entire set is “Crossbones’ Hazard Heist.” The set is part of the Captain America: Civil War series of toys from Lego and the box includes 179 pieces. In addition to Crossbones’ jeep, Black Widow has her own motorcycle that she uses to chase down the villain. The jeep is studded with weapons and Crossbones himself is equipped with a small firearm that has a translucent fire element that can be used in this Lego diorama. Falcon is also equipped with his own weapon, and his flight suit also has a detachable Redwing drone that can be used for espionage or support. The only real disadvantage to this set is that it doesn’t really come with a lot of pieces, so if you like a lot of detail, this isn’t the set for you. Having said that, since it’s designed for people six and up, this makes it easy to put together for even the little ones. 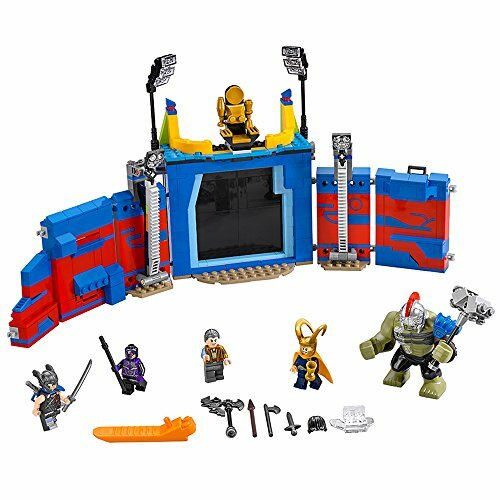 If you or your children are fans of Thor Ragnarok, then the scene taking place in this playset will seem very familiar. In it, Thor is facing off against Gladiator Hulk, and there are several supporting minifigures, which include The Grandmaster, Loki, and a Sakaarian Guard. 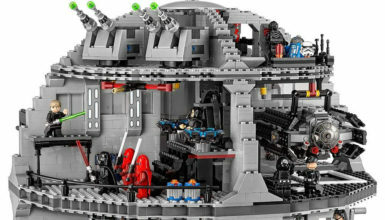 In total, the set comes with 492 pieces, and it’s specifically designed to be built into a battle arena, but there are several other options for building. The arena also includes arena lighting, dividers that can be raised and lowered, and a comfy throne for the manipulative Grandmaster. Each segment of the arena wall is articulated, so you can open and close the set at will. 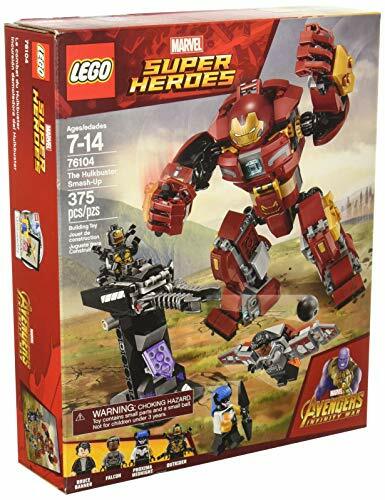 Also, all of the minifigures are standard Lego minifigures with the exception of the Hulk, who has a unique design and his own Worldbreaker mace. When it comes to the playset’s measurements, the entire Arena Clash set is seven inches high, 15 inches wide, and two inches deep when you open it, so it definitely takes up some space. The set is also designed specifically for kids over the age of seven to enjoy. 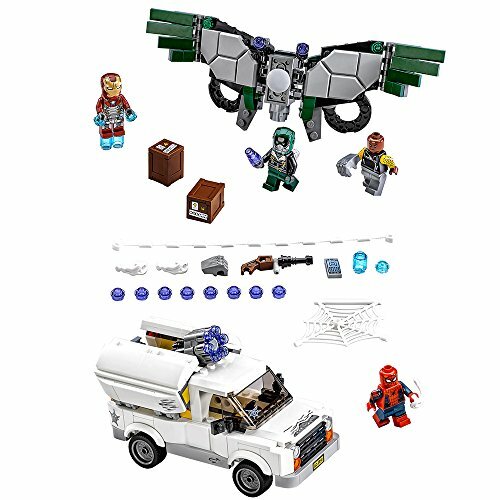 This is another set that features both Spider-Man and the Vulture, but this time, they’ve thrown in the Shocker and Iron Man for good measure. This is a 375-piece set, and it includes a getaway vehicle for the Shocker, a wingsuit for the villainous Vulture, and opening crates that help world-build during play sessions. Each of the characters also has plenty of accessories to build your scene, which includes webs for Spider-Man, rockets for Iron Man, and shock gloves for the Shocker. Spider-Man also has power blast webbing, which allows him to fire pellets at his enemies. Like many of these Marvel-themed Lego sets, this set includes a comic book that describes the harrowing action that’s occurring in the scene. The scene is also meant to evoke some of the action from the 2017 movie, Spider-Man: Homecoming, so if you’re a fan of the film, this is a great set for reliving some of the scenes. Unfortunately, the Vulture’s wings can be a bit flimsy and have a tendency to fall apart in segments. Did you love the 2012 movie, the Avengers? 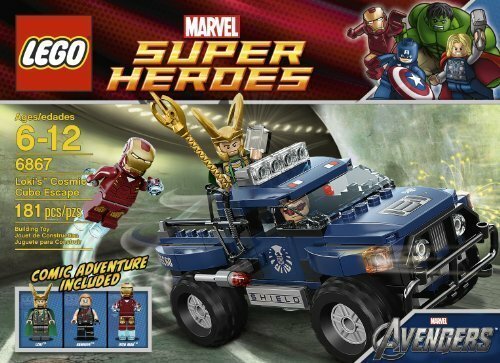 Well, if you’re looking to relive some of the action, this Lego set, which features Iron Man, Hawkeye, and Loki will bring you right back into the action. In the set, the villainous Loki is using his control over Hawkeye to steal the Tesseract from S.H.I.E.L.D. custody, and Iron Man is in hot pursuit. Loki and Hawkeye are using a S.H.I.E.L.D. jeep to get away, and Iron Man has individual Lego retro rockets to keep up with his quarry. In addition to the clear pieces that represent the rockets, Iron Man also has clear repulsor pieces that clip onto his hands. Loki, on the other hand, is brandishing his Infinity Stone-powered staff at his foe as Hawkeye drives. When not driving, Hawkeye has a bow and arrow that snaps into his hands, which can help power some intense standoffs. The off-road S.H.I.E.L.D. vehicle is also very realistic and measures in at three inches high, and five inches long. All of the characters will fit in the cockpit, and the body of the off-roader is studded so that all can stand on it while it’s careening forward. The only drawback is that the wheels could be a bit more rubberized – they are somewhat hard-surfaced. 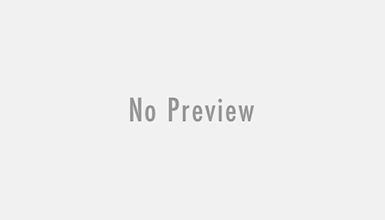 Captain Marvel is currently riding a wave of popularity, and this recently-released set features an exciting scene from the film. Included with the set, you’ll find minifigures for Captain Marvel, Nick Fury, Talos, and Captain Marvel’s feline friend, Goose. The set comes with 307 pieces, so you’ll be able to assemble a Quinjet, which is the prototype for the planes featured in the Avengers films. The Quinjet has plenty of components that are fully articulated, which include movable wings, rear thrusters, and a cockpit that can be opened. There are also several weapons emplacements throughout the body of the plane, so it’s going to be ready for battle against Kree or Skrull foes. Captain Marvel has removable hand blast components that can be held in her hands, and both Fury and Talos have handguns. The set is designed to be easily buildable by anyone over the age of seven, and it should take less than a half hour to assemble fully. 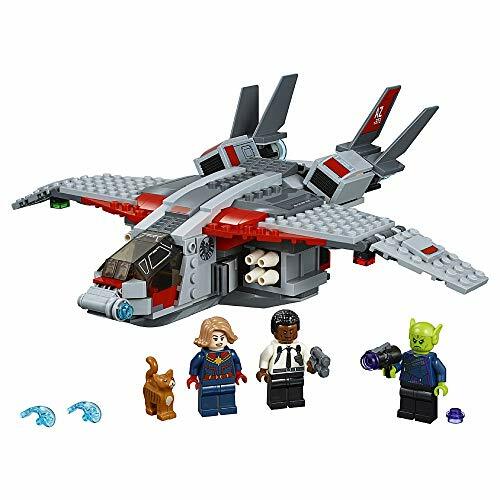 Builders will also probably love the fact that the entire top surface of the Quinjet is studded with Lego connectors, so running around on top of the aircraft is possible for the minifigures. 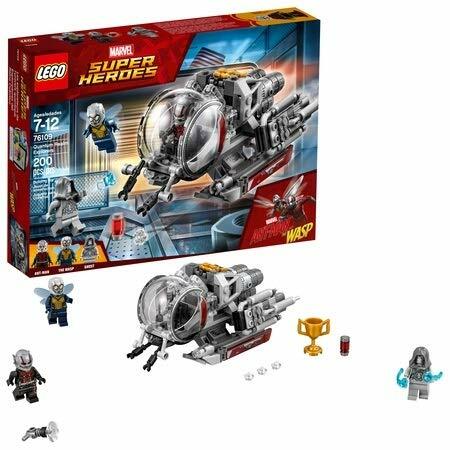 Ant-Man is a small-sized her that has full-sized adventures, so it’s no surprise that the Lego sets that are based around the character are full of fun and exploration. This set, which is the Quantum Realm Explorers set, features both Ant-Man and the Wasp as well as the Ghost character, which serves as the main villain for the film. The collection has 200 pieces and also features a quantum vehicle, which the two heroes can use to explore the miniaturized universe. The ship is designed with a bug-eyed look and has several components that are designed to move and bend with relative ease. There’s even a stud shooter in the front that you can use to fire at any small-sized villains that may try to crash the party. The vehicle also stands out because of the fact that it has three flight modes, which include launch, flight, and hover mode. 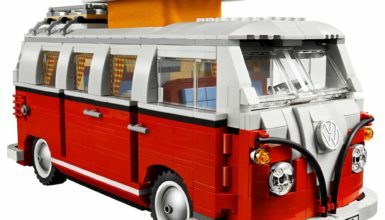 There are even two clasper pieces in the front of the vehicle that can be used to pick up any object that the minifigures can pick up. 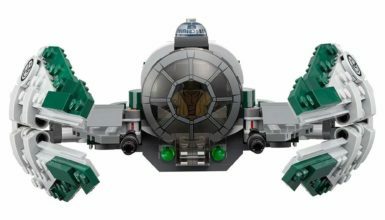 Any of the minifigure models can fit within the cockpit, which would make for a great team up storyline. Each of the minifigure models also includes their own accessories. For example, Ant-Man comes with his own shrink gun, the Wasp comes with insect-style wings, and Ghost has two power blast that she can grip in her hands. The only drawback to this set is that the bug-eyed cockpit doesn’t really provide a lot of options if you wanted to use the pieces to build something different.